Maccabi South Africa is excited to announce that #TeamMaccabiSA will be competing in the 15th European Maccabi Games (EMG) in Budapest, Hungary from 29 July – 07 August 2019. It is with great excitement that #TeamMaccabiSA has accepted an invitation to take part in the European Maccabi Games. Hosted every four years in a different European city, and two years after the Maccabiah in Israel, the European Maccabi Games attracts 3000 participants, from approximately 30 countries, participating in 26 different sporting codes. South Africa is one of the seven non-European countries invited to the 2019 Games. #TeamMaccabiSA will be represented by 90-100 athletes, which will be one of the top 10 biggest delegations at the event. We will be competing in futsal, half-marathon, swimming, table tennis, tennis and triathlon. All the events will be held at world class facilities, most of them having previously hosted other major international events. Note: Marathon, table tennis and triathlon to be managed by Jarred at Maccabi SA. EMG is not only a sporting event but also a Jewish cultural celebration. The Jewish Cultural Feast, which is the biggest Jewish festival in Europe, takes place in Budapest every year. The event will be held during EMG in order to allow delegates to experience the vibrant Hungarian Jewish life. The teams will also have a unique Shabbat at the famous Dohány Street Synagogue. Known as the Great Synagogue of Budapest, it was completed in 1859 and is the largest synagogue in Europe, seating 3000 people. “We are delighted to be flying the SA flag at the upcoming European Games, with such a large and talented team. 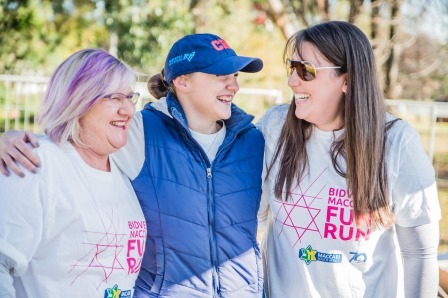 We wish all our participants the best of luck and trust that the experience will be rewarding and meaningful, taking place in a city steeped in Jewish history,’’ said Cliff Garrun, Chairman of Maccabi SA. #TeamMaccabiSA, led by Garrun, participated in EMG for the first time in 2015. The Games were held in Berlin which was of great significance as they took place in the Olympic Park near the 1936 Olympic Stadium, where Jews were banned from the German delegation. Almost eighty years later, 2500 Jewish athletes sang HaTikvah and proudly displayed Magen Davids in a place where Nazi flags once flew. Am Yisrael Chai! The SA delegation of 35 athletes competed in two sports, bringing home two bronze medals for futsal and eight for swimming (five gold, three silver).